Oct 30 Could We Have Some NY-LA Fires Stoked? Several news outlets are reporting that Joe Torre is about to be named the manager of the Los Angeles Dodgers and, apparently, lapdog Don Mattingly will be going with him. After yesterday's news of Joe Girardi getting the Yankees managerial job hit, Mattingly said he would accept no job within the Yankees. Ah, I see, Don. You want to be the manager of the most expensive and most valuable team in major league baseball... the team that outspends everyone... and you have zero managerial experience... and if you don't get that job, you're taking your baseball and going home. Do I have that right? Fine, then get lost, you hayseed. 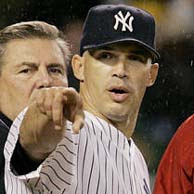 Here's the truth: If Girardi is successful and the Yankees win, he'll be here a long time. If he's not successful, he'll be here less than four years. Either way, if the Yankees go to Don Mattingly in the future and tell him they want him to come home and manage the team he loves, where his number is retired, etc., then of course he will. And if he doesn't, then he's just dumber than he appears. The most intriguing part of this to me, though, is that the Dodgers might be able to trump the Yankees in terms of press. The Yankees may announce Girardi as their new manager today and it's very possible that the Dodgers will announce a bigger name (Torre) as their new man either today or tomorrow. Whenever it happens, if Torre takes Mattingly the old Yankees-Dodgers mutual dislike that's been dormant in recent years could be re-stoked. Remember, these two teams played each other in the World Series a lot back in the days when the Dodgers were in Brooklyn. The fan bases hated one another. Even after the Dodgers went to glitzville, the two teams met up in the World Series in '77, '78 and '81. 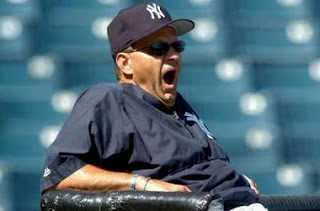 How much fun would it be to see Torre in Yankee Stadium in the World Series... against the Yankees? Okay, okay, for those of you who hate the Yankees and don't want to ever see them in the World Series at all, I guess it wouldn't be fun. But for some of us, it would be good entertainment. For as much as I am a true Yankee fan, I wouldn't hate seeing Torre stick it to the Steinbrenners.